Once a month a take a trip to my nearest china town and stock up with all my Asian herbs, spices, sauces, seeds, nuts, grains, noodles and many more for the café and for home. You really find such great buys there, and things you would never find in your local Pick n Pay or Spar. Black rice is one of them. It has quite a similar look / feel to sushi rice, a little sticky, but really no flavour at all. So you need to make a great dressing for it. Try this recipe, its a great accompaniment to some crispy duck or some lightly fried fish. 1. Bring rice and 3 cups water to a boil in a small saucepan. Cover, reduce heat to low, and cook until water is absorbed and rice is tender, 25 to 30 minutes. 3. 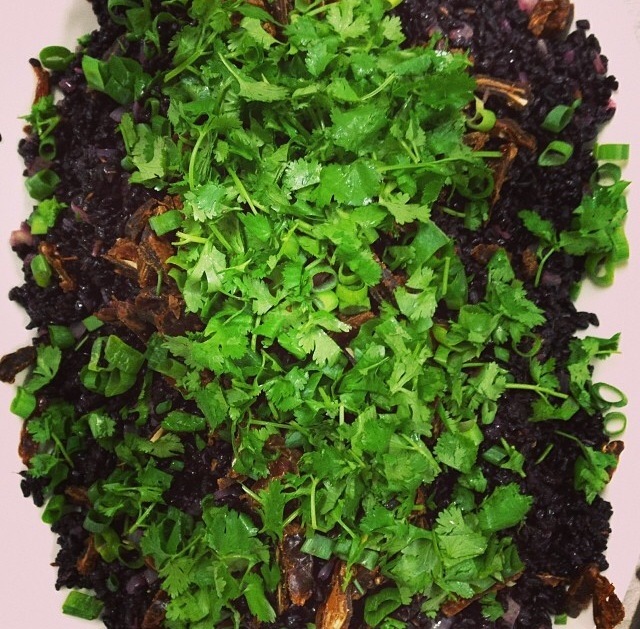 Mix dressing with black rice and once cooled add herbs and spring onion. Season to taste with salt and pepper.